Today I was taking few pictures at S Maria della Salute, ahead of tomorrow big celebrations for the traditional feast..... During the day I overheard many tourists mainly Italians asking to the local where was the Basilica and the reply of the locals was all the time a vague without really pointing it or giving directions "Xe a" (It is there) I loved it! 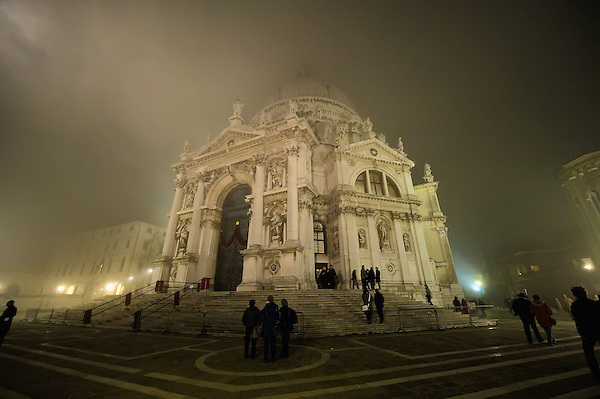 Anyway the Festa della Salute is the least "touristy" of the Venetian festivities and evokes strong religious feelings among the city's inhabitants. The holiday is in memory of a bout of pestilence, which lasted for two years from 1630-31, and the subsequent vow by the Doge to obtain the intercession of the Virgin Mary, even today, thousands of inhabitants visit the main altar of the imposing Salute Church on November 21 to give thanks, and a strong symbolic tie remains between the city and the Virgin.